Japanese: 東方鈴奈庵 ～ Forbidden Scrollery. Touhou Suzunaan: Forbidden Scrollery. is a Touhou official comic published by Kadokawa. It introduces the human book renter and collector Kosuzu Motoori as the main character, with the story centered around her mysterious ability to decipher any book no matter the language or script, and her assortment of various rare and dangerous demon books. Marisa Kirisame runs into Hieda no Akyuu on her way through the Human Village, and notices that she's carrying a strange book—a youma book, said to be indecipherable. Afterwards she makes her way to the Hakurei Shrine to ask Reimu Hakurei about them, but she doesn't know much on the subject. Marisa explains their dark and mysterious nature, and the two decide to take a visit to Suzunaan to talk to Kosuzu Motoori about it. She reveals her collection of demon books, as well as her recently-awakened powers that allow her to decipher any sort of script. Reimu worries that it might be dangerous, but Kosuzu is not very concerned. Touhou Suzunaan: Forbidden Scrollery. has been published in English as Forbidden Scrollery by Yen Press since November 21, 2017. Touhou Project has grown to become quite a large multimedia franchise spanning from official video games, novels, mangas, artbooks and music CDs. There are also tons of fanmade stuffs such as music remixes, anime, fanarts, fanfictions, doujin mangas, fangames etc. It is quite difficult to get into the fandom out of nowhere because of the overwhelming amount of works of it. Here, I would recommend Forbidden Scrollery as a start to begin your venture into Touhou Project. In a familiar manga medium, Forbidden Scrollery is primarily about the wonders and mysteries of the world of Gensokyo. Through the eyes of a normal human, Kosuzu Motoori, we are introduced to the numerous existence of the other Youkai races that inhabit Gensokyo alongside humans - ranging from the Tengu, Tanuki, Kappa, and many others. Many of the prominent characters of the Project also make their appearances, and the manga did a good job giving them sufficient panels so the readers would know who they are. Some of the most powerful beings in Gensokyo are present, such as the gap youkai Yukari Yakumo, the vampire Remilia Scarlet and the mask youkai Hata no Kokoro. From here, the reader will be able to have a good grasp on some of the characters and this will serve well as a stepping stone to get into the franchise. If you ask me what genres do Forbidden Scrollery belong to, here they are - Fantasy, Supernatural and Mystery. Gensokyo is a fantasy world where supernatural beings and occurrences belong. A huge part of the plot is about mystery, such as solving the mystery of sounds heard in the middle of the night (turned out to be animated objects walking around at night), or some mischievous Youkai causing trouble to the human villagers that needed extermination. It is quite a straightforward read, while it may be dialog-heavy sometimes, which helps to build the world and characters for the readers, overall the plot isn't overly complicated and it certain doesn't drag. While Touhou Project is officially a danmaku shooting game (mostly), there isn't much action to represent the game. Instead, we get something more akin of a slice-of-life drawing style, featuring Moe Harukawa who has the art style of drawing the Touhou girls in a rather cute fashion (you can see some of them from MAL directly). Meanwhile, the granddaddy behind Touhou Project, the great ZUN himself, is penning the story for the manga. All in all, I would say Forbidden Scrollery serves as a great introductory medium to the Project. There's nothing groundbreaking or epic to be expected while reading it, instead, you will be given a delicious trip into the wondrous world of Gensokyo itself. People fear the unknown, and perhaps more importantly, try to understand it. I'm a massive Touhoufag - expect a nigh-incomprehensible review unless you are one as well. Forbidden Scrollery is about a curious human girl thrust in a world where she does not belong; the land of Gensokyo, a land filled to the brim with mythological gods and youkai. A place where humans are weak and the minority, and not the leaders of society. With a newfound ability to be able to read anything in any written language, she delves deeper into the world of Youkai, something that she has little understanding of beyond the written wiles of other humans. Forbidden Scrollery is a Touhou printwork that delves into a darker, somewhat more serious side of Gensokyo. With this entry, the already established world of Touhou becomes deeper, and knowledge of what kinds of lives humans live in the land of Gensokyo becomes more apparent outside of the human-centric bias of the Hieda's written stories in other printworks like Perfect Memento in Strict Sense. Forbidden Scrollery has much less bias in the protagonist, in that it does not try to preserve the present state of affairs Gensokyo currently has. ZUN, the creator of Touhou, likes to play with perspectives in his written works. As Touhou is not a franchise that focuses on an enthralling story but rather in creating a wondrous world, such types of writing is a welcome thing for many fans like me. Being able to perceive the world in massively different perspectives of different types of characters makes the world a lot more alive and much less stale, while at the same time not make it seem jarring. Thusly, in contrast to Sangetsusei's whimsical fairies and Wild and Horned Hermit's youkai enigma Kasen, we partake in the perspective of a human who knows nothing about the world she's in but the very basic of what already skewed information she already has available to her. There is certainly something to behold as an innocent character tries to wander about around the setting trying to find answers. Especially that sometimes, humans aren't quite satisfied with the answers they find. In where humanity truly exists for a reason, what would a human do when the reason isn't quite as charming as it should be? 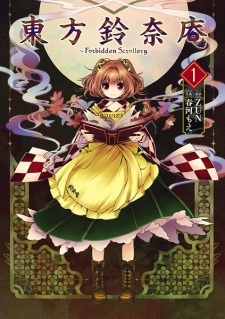 Forbidden Scrollery is about Kosuzu, but in a sense, it's more about the ever evolving world of Touhou. Questions regarding the state of humanity in Gensokyo, the status quo, how in control of their lives they actually are, and much more are in the contents of this manga. Essentially, Forbidden Scrollery is not about Kosuzu learning about the world around her, but rather, a human learning about the world around her. The character itself isn't quite as important as what she stands for in the world of Touhou. Duly note that Forbidden Scrollery is not about some grandiose adventure to unearth the history and mystery of Gensokyo. It is about the daily life of a human child slowly understanding the world around her through the various people and objects she interacts with. It's much more of a Slice of Life than any other genre. For a series not much about plot, each episodic or semi-episodic entry is quite amusing even on its own. Each small arc in Forbidden Scrollery tells something about the world of Gensokyo and how it works, or expands upon something already known even further. Some of the less prominent characters in Touhou also make appearances, and we see how they interact with the world of humans as they either frolick about or scare the populace for fun. All in all, everything still ties to world of Touhou. Touhou is the Warhammer of Japan. /tg/ will agree on that, I'm sure. I have so much more to talk about this, but I'd rather end this than write up 10,000 more words. Also want to note that Moe Harukawa's illustrations and drawings are top notch, and one of the best things about the manga. All in all, Forbidden Scrollery is a very welcome addition to the world of Touhou, and I sincerely hope future printworks follow what Forbidden Scrollery has. It presents us a side of the world of Touhou we both always and never see, the world of humans. Overall my favorite Touhou manga. Other than the somewhat rushed ending and the impenetrable wall of Touhou that prevents anyone that knows nothing about it to understand it (which is somewhat of a positive, really), Forbidden Scrollery is something great and not often seen. ZUN is a genius, as a man who have a family, lots of life experience and alcohol, ZUN's work drips with messages and his life views, and as a result tend to run deeper than most manga and anime, one chapter of Forbidden Scrollery is worth a deep analysis about both the lore and messages, and is more fulfilling than 10 or more chapters of any other manga. Suzunaan's story revolves around the book store called Suzunaan ran by the family of Motoori Kosuzu, and ties into the ongoing world of Touhou lore. Featuring stories ranging from the dangerous youkai books kept within Suzunaan to ongoing incidents such as the aftermath of Legacy of Lunatic Kingdom. From the way the story is told, it should be categorized as a Slice of Life, but Suzunaan accomplished what all of those sad excuses of a story could not do, it is immersive. Well...technically that is the common appeal of the entire Touhou franchise, but in terms of manga, Suzunaan manages to convey the culture and world in it as a very believable world, even while it is very alien. It is said that it is what the author don't say that shows the skill of an author best, and ZUN certainly taken that to heart. For example, without showing Yukari at all, ZUN was still able to paint her as a master schemer, like in the year-end Doomsday urban legend event, after LoLK, we know that Yukari took the lunar power stone, yet we don't know why, and after reading chapter 35, it all comes into place like a jigsaw puzzle, and makes you go "Oh, so that's why she did that", and taking in the events of the doomsday rumour, you realize that everyone was just dancing on her palm, and this was done with NO exposition or SHOWING Yukari at all. Masterful, I actually had to use my brain for once and actually piece together the story from the clues scattered all around. It is like a multi-layered sweets, the first layer is really easy to dig into, but once you dig harder and connect it to other lores you realize there is another layer underneath it all, and when you dig even deeper you find even more layers, and in your excitement to keep digging deeper into the lore, you became a Touhou fanboy, Congrats. Forbidden Scrollery is a lot more different than your typical Touhou manga. Unlike the more whimsical Wild and Horned Hermit, or the lighthearted Three Fairies manga, Forbidden Scrollery tells a more serious, perhaps harrowing tale of life in Gensoukyou, seen through an ordinary human inhabitant rather than a person with considerable power. This, I feel, is one of the strengths of the manga, and what makes it stand out from the rest of the Touhou manga. World-Building is top-notch as per ZUN's previous works, but the story, now delivered in 2-parters, are excellently told and often contain twists and turns, some unexpected, that make for an enjoyable read. Characters are also very well written here. Main protagonist Kosuzu in particular, may seem like an innocent character who's a bit naive, has depth in her characterization in which she actually comes across as much more manipulative as she may initially seem. Other supporting characters are given as well, series protagonist Reimu, for instance, is given a much more serious portrayal, who very willingly will go through whatever it takes to upheld the law and decency in Gensoukyou, a far cry from her lazy attitude in Wild and Horned Hermit, but still doesn't feel out of character with her attitude across the franchise. Overall I recommend Forbidden Scrollery to all fans of good material.